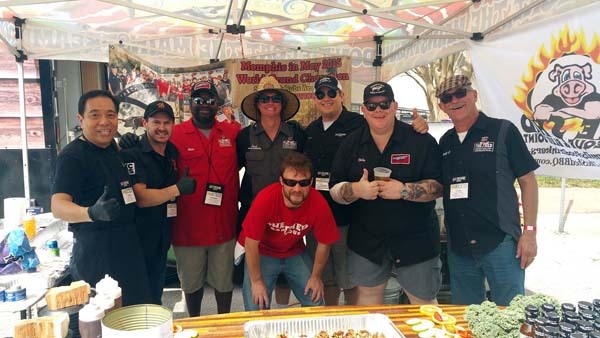 The 2016 National BBQ Association conference in Jacksonville, Florida, from March 9th to 12th hosted several thousand members of the public and over 200 members, sponsors, and vendors. 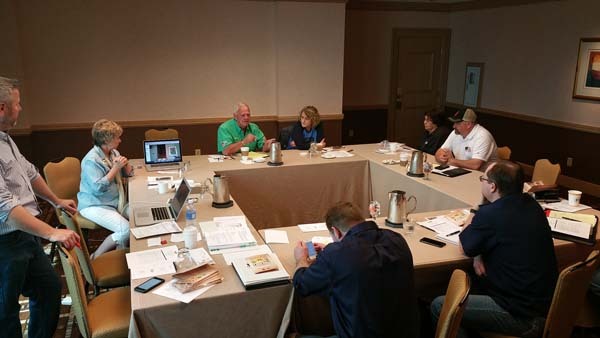 The NBBQA is the sole trade association in America focused on the business of barbecue. 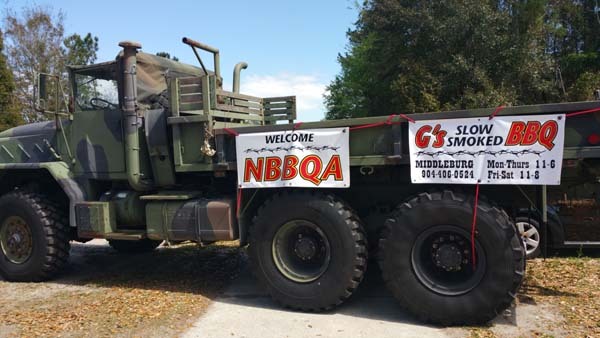 The NBBQA helps its membership generate more revenue, lower business costs, and learn about a wide variety of topics. These topics are voiced on a national stage, bringing in resources from all parts of the country. I was honored to serve as the region one western states board member serving California, Nevada, Arizona, Oregon, Colorado, Idaho, Montana, Wyoming, and Washington. On March 9th, I joined the Board for a half day strategic planning session under the leadership of president Linda Orrison, and CEO Stuart Meyer. 2016-2017 will be an exciting year for the NBBQA as the emphasis will be on preserving the past legacy of the NBBQA while fueling the growth of barbecue in America and the world. 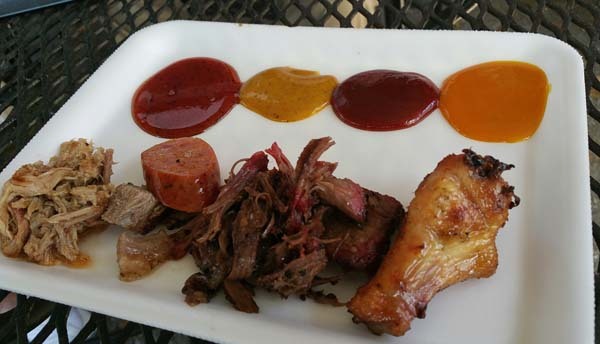 We talked about a “Culture of Connectivity” as a way to include all types of barbecue styles. Our goal was to dismantle any perceived separation between low-and-slow and grilling folks. American style barbecue and grilling is just the tip of the iceberg. There are many other live fire cooking styles; kebabs in the Middle East, yakitori in Japan, satay in Southeast Asia, braai in Africa, churrascaria in Brazil and Portugal, and many other cooking traditions. 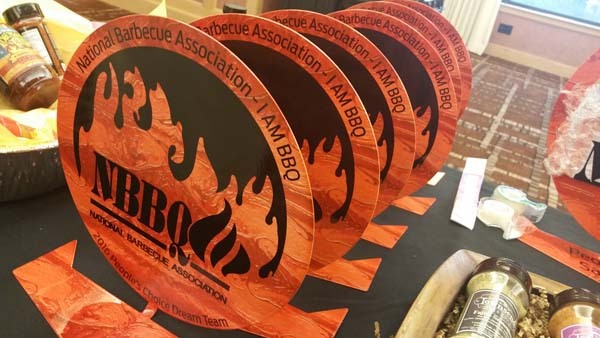 The aim of the NBBQA is to create one inclusive barbecue family. I’ll share more on this program (catering, rubs and sauces, sponsorships, education, competition, and so on) in the coming months. Another important theme was More Doing Less. The idea is to encourage members to roll up their sleeves and contribute to the specific interest areas. The analogy is the NBBQA will have many “runways” to land. Members will be able to find expertise and support in barbecue business areas of interest. For example, if you’re looking for information on “barbecue restaurant equipment”, there will be a member moderator to help you out. 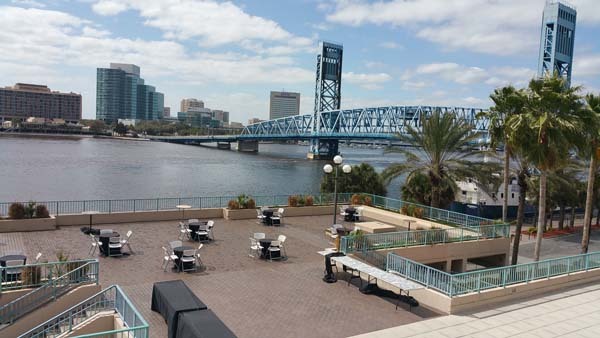 After our strategic planning session at the Waterfront Hyatt hotel, I joined the BBQ tour to check out three local restaurants in the Jacksonville area. Two tour buses drove 70 members for the next 4 hours to three local BBQ joints; G’s Slow Smoked BBQ Hut, Sonny Real Pit BBQ, and 4 Rivers Smokehouse. Each stop lasted about an hour and we were treated to some delicious barbecue, sides and sauces. After returning from the tour, Smithfield Foods hosted the evening reception in the hospitality tent. Thursday and Friday were full days of lectures, discussion groups, vendor demonstrations, evening receptions, and cook-offs. Here is a brief summary of the very informative sessions. Robert Moss, a writer for the Southern Living magazine, described the history of American barbecue. Barbecue began as a free social gathering. Folks were invited to enjoy meat cooked in ember-filled pits dug into the ground. It was especially popular for politicians to host free barbecue events to attract a captive audience. This was followed by the commercialization of barbecue. Small barbecue shacks and tents began to grow across America. Roadside barbecue restaurants took off when automobiles created a need for America’s first take-out “fast” food. This trend dipped in the 1950’s. Even a barbecue restaurant called MacDonald’s (yes, the worldwide chain today) replaced their elaborate and lengthy barbecue offerings with burgers, fries, and shakes. Today, barbecue is bigger than ever. There are barbecue TV shows, classically trained chefs cooking over live fire, and regrowth of regional styles. 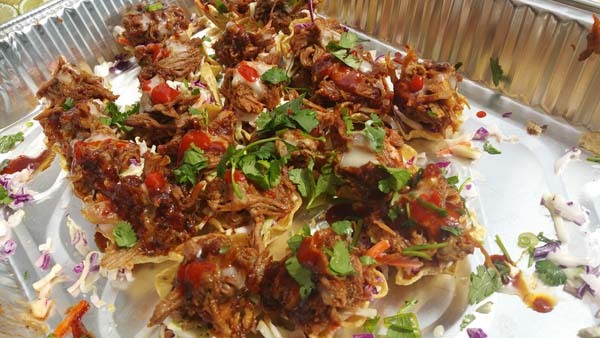 Barbecue restaurants are increasing in popularity in America and overseas. Steve Raichlen, James Beard award winning author and barbecue celebrity gave a historic view on the beginnings of barbecue. He explained how barbecue began with our 2 million year old predecessor, Homo Erectus. Mr. Raichlen postulated that the discovery of fire and cooking evolved our species. Our formerly large jaws and teeth needed for chewing uncooked food evolved to the small jaws of the modern Homo Sapiens. The increased calorie intake of cooked food meant our one pound brain could evolve into the three-pound brain. I found this fascinating. There was a two hour power session on barbecue catering. Brook Lewis and Cheryl Atkinson from The Shed BBQ, Kennon Adkinson from Sonny’s BBQ and Duce Raymond from Sweet Baby Rays presented a very in depth class on catering. They gave us insider information on how to grow your catering business and profit margins. Having a clear process for handling delivery channels in the catering business was essential for cutting expenses and remaining profitable. Additional topics such as tablescaping, value added options, financials, metrics, and ratios were presented. Jim Murray from the National Pork Board and Daniella Shubert from the Beef Board conducted a Butcher Shop class on pork and beef. They processed primal cuts into lesser-known cuts. These new added value cuts of protein are gaining popularity in the restaurant scene. Becky Streuder, our region 3 vice president, presented the NBBQA Awards of Excellence to the winners of the sauce, equipment, and rub categories. 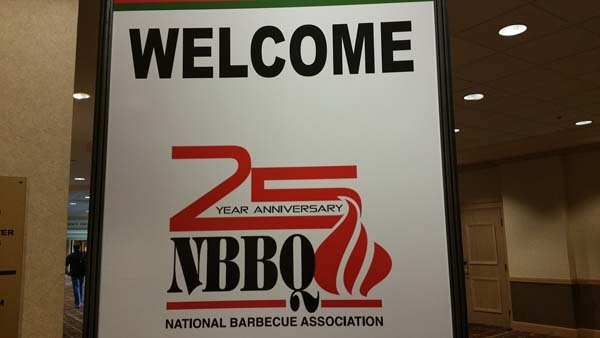 Amy Mills from 17th Street BBQ, Barry Sorkin from Smoque BBQ, and NBBQA CEO, Stuart Meyer presented a session on “Mastering the New Marketing Mix” which talked about the changing marketing tactics and social media landscape. They discussed where and how to concentrate marketing efforts and dollars to grow the barbecue business. A panel of industry experts Duce Raymond of Sweet Baby Ray’s, Kurt Koegler, CFO of The Saucery, David Griffo of Allegro Co-packers, Steve Wallace, Food Broker, and Heath Hall, of Pork Barrel BBQ conducted a Q&A on the Blueprint for Retail Success for sauces. 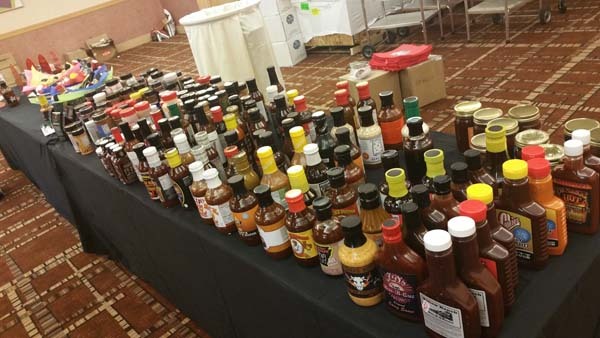 They candidly described how there seems to be a million sauces in the marketplace and provided strategies on how to differentiate your product. This included the entire process from kitchen to retail markets. They gave expert insight into how to get started in the local markets and how to transition from the minor to the major league national retail markets. We enjoyed a barbecue dinner presented by Sonny’s BBQ. 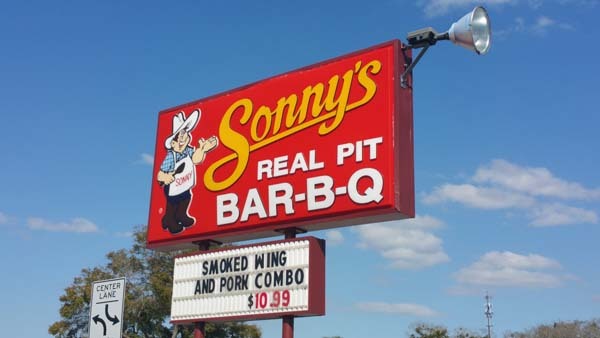 Sonny’s has a year-long Pitmaster Academy Program to train their employees into full-fledged pitmasters. 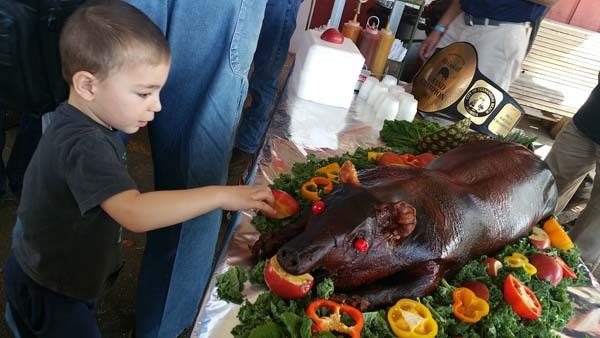 Graduates are well-versed in all aspects of barbecue history, traditions, and techniques. Patrick Murphy from Company 7 BBQ together with Renato Barbon, Sonny’s BBQ CFO and Kurt Koegler, CFO of the Saucery spoke about financial techniques to track revenue and expenses so you are profitable at the end of the day. In another session, there was a panel of cooks and judges talking about competition barbecue. Mark Lambert of Sweet Swine O’Mine, Susanne Rhea and Elise Jenkins of the MBN, Carolyn Wells of KCBS, Tuffy Stone of Cool Smoke, Myron Mixon of Jack’s Old South, Jim Elser of Sweet Smoke Q, Will Cleaver of BBQscores.com, and Chris Lilly of Big Bob Gibsons gave insight into the Minds of the BBQ Competition Cooks and Judges. They discussed expectations and experiences on both sides of the judging tent. Dr. Andrea Garmyn of Texas Tech University gave a technical lecture on meat and what it is made of, what influences its quality, the impact of seasonings and marinades, and what happens when it is exposed to heat and smoke. 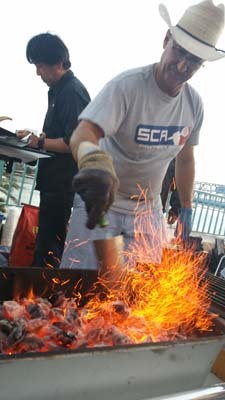 Meathead (Craig Goldwyn), of Amazing Ribs.com conducted a Science of Meat & Smoke presentation. He demystified common myths about heat, smoke, and meat, and how they interacted. He also talked about types of heat: convection, conduction, infrared radiation, excitation, and induction. He ended with a discussion on how heat and temperature differ, and how smoke is made and its composition. 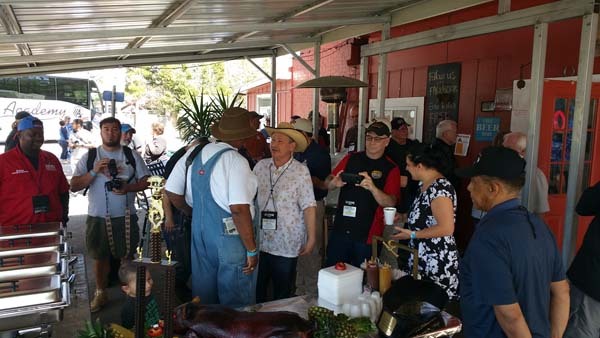 Attendees were treated to a Q&A session moderated by Dr. Barbecue (Ray Lampe) where a who’s who of world class barbecue folks shared interesting insights and stories about their individual barbecue journeys. On Friday evening, attendees were treated to a celebrity steak cook-off and dinner event. The 2014 and 2015 Steak Cookers Association (SCA) champion, Johnny Joseph took on contenders trying to dethrone him. I ate samples of Johnny’s steak and it was superb. 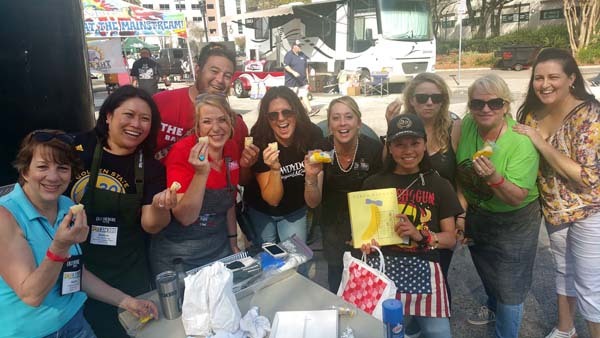 Most of Saturday was spent at the Jacksonville Landing on Hogan Street where 10 composite “Dream teams” cooked in the NBBQA JAX BBQ Bash, presented by Sam’s Club. I cooked on Brad Orrison’s The Shed Dream team and help serve the several thousand members of the public who were eager to sample world class barbecue. We gathered Saturday evening for the NBBQA 25th Anniversary Dinner and Auction after a long and fun day of cooking for the public. Our president, Linda Orrison, presented several awards. After dinner, we were entertained by pitmaster and comedian, Vic Clevenger who was on his Pure Southern Comedy Tour. By Sunday morning, most of us had planes to catch to head home. 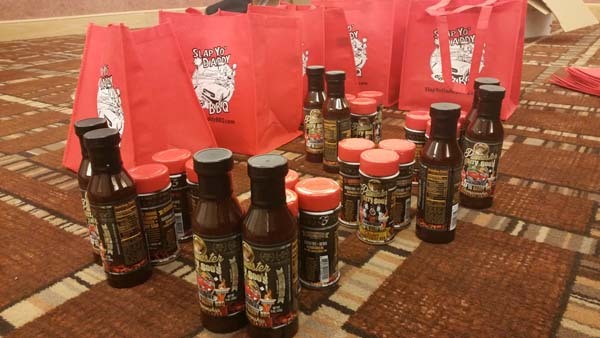 Slap Yo Daddy BBQ sauce and rubs Goodie Bags for Auction Night. 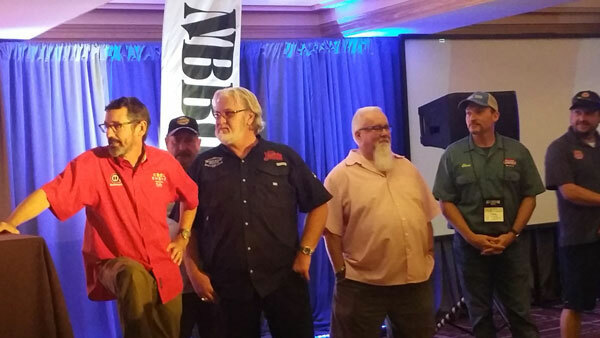 For me, the 2016 NBBQA National Conference was an educational and fun experience. I learned that there is much that I don’t know despite being in the barbecue business for 8 years. I made new friends and reconnected with old ones. I can’t wait to attend the 2017 conference which will be in Fort Worth, Texas next year. A big thank you goes out to all the NBBQA Board, staff, sponsors, attendees, helpers, and volunteers who made this conference a great success. Looks like a brilliant learning event. Will you invite delegates from Europe next year? You can email me at [email protected] and I’ll get you more information on the 2017 event in Fort Worth from March 29 to April 1st, 2017. Yes, we are trying to get some international dream teams from around the world. Definitely want some pitmasters from Europe. I’m inviting the British and the Danish as I’ve taught them barbecue classes. Great post, with some awesome photos! Sorry I did not have a chance to say hello to you personally. Will be sure to meet up with you next year in Texas! Seeya in Fort Worth in 2017 from March 29th to April 1st.